I'm tempted to leave the entire book review as that single word. Recommended. Clearly I didn't, because I'm still typing, but I'm definitely tempted. I had "started" this book a few months ago, and by "started," I mean, "read the first page." The timing wasn't good, so I didn't keep going, because Kay's books aren't put-downable. Yes, a real word that, "put-downable." This book wasn't. And what better day to read the book than jet-lagged and sick, and in need of comfort? Said jet-lag may have enabled me to stay up until 6:30 am to read this book. Or maybe not. It's like a migraine that way, maybe the caffeine causes it, maybe the caffeine didn't. So, this book. It's "historical fiction with a twist of fantasy," as Kay describes others describing his works. I would say that description was true of his earlier books, but not really this one. While there is an itty bitty part that requires suspension of disbelief, the rest of it is pretty much a fictionalized story of the fall of the Ottoman Empire from a merchant's, an artist's, and soldier's points of view. But, ssssssssh, it's not really called the Ottoman Empire. Kay moves back to his earlier style of writing in this book, in that in his earlier books, he wasn't explicit about the thoughts behind the characters actions, leaving the reader to piece things together and fill in the gaps. Subsequent books, he drifted to explaining everything, which lost some of the magic of his writing style. He has it coming back here, which makes me like this book so much more. If you like his style, this book is recommended. If you haven't read Kay's books before, read A Song for Arbonne or The Lions of Al-Rassan first instead. 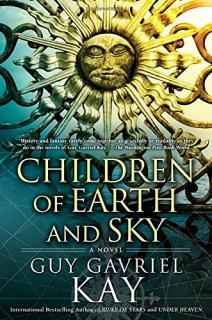 Having spent most of last week reading and (thankfully) completing a, uh, not so well written book, I switched to reading The Last Light of the Sun, by Guy Gavriel Kay. If you had asked me a decade ago who my favorite author was, I might have told you Heinlein, a decade before that it was Ayn Rand, even though I've been reading Kay's works for those two decades. However, I do have to say that, aside from Atlas Shrugged, I haven't reread (more than once) any of Rand's works, and only a very few of Heinlein's books, either. Kay's books, however, I keep rereading, and more than just once. I don't know if Last Light will join the must reread pile, as the Fionavar Tapestry series (of three books) has, but it might. Right after The Lions of Al-Rassan. I really like Kay's style of writing. I don't know that I'm necessarily drawn to his recent genre of choice, which is fantasy style historical fiction (with the names changed! ), but his style of writing makes up for the indifference I have to the settings. In Kay's earlier books, he was much more subtle in his writing. Instead of spelling out the reasons behind every character's action, he would narrate the action, and leave the motivations up to the reader to figure out. I remember walking away from some of his earlier books, puzzled about what the heck just happened, and why, only to figure out later when subsequent actions revealed prior motivations. I thought that Last Light was the last book Kay had written, but I was mistaken. I usually purchase his books when they are first published, but wait until I'm sure I have all of the ones in a series before starting to read them. I hate waiting a decade for authors to finish works (thinking Martin and Jordan right now). Yeah, so maybe I'll head off to read Kay's last book. Maybe I'll try for the fourth time to finish Catch 22. Now wouldn't that be an accomplishment.